This new show by aerial theatre specialists Ockham’s Razor is a test of trust, timing and teamwork. Cooperation and reliance upon one another are integral to the performance. A chalk circle drawn at the opening of Tipping Point is all that separates the company and its audience, while the simple act of one performer pouring chalk dust into the hands of the others becomes almost ritualistic. 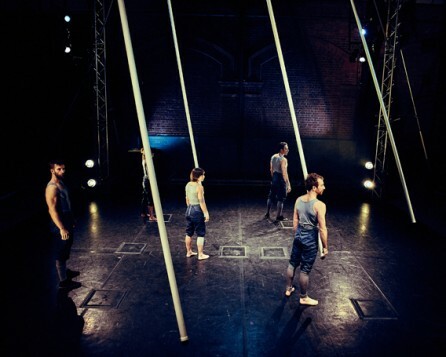 As the five performers balance upon, wrap around and pull themselves, ape-like, up vertical swaying poles, they find ever inventive ways to push the precarious points of balance between their bodies and the poles. Even though their performance is inherently hazardous this doesn’t stop Ockham’s Razor from revealing a mischievous sense of humour. The smallest member of the group switches between two poles, balancing upon them like a tightrope walker. It’s a routine that relies on co-operation and control, a fact which becomes clear when the team she has so implicitly placed her trust in begin to play with her tipping point – physically and personally. As they move the poles before she is ready, she is forced to instinctively catch at her ever-changing points of balance. It’s an amusing yet gripping sequence. Unsurprisingly, her trust must be re-gained and it’s not until much later that she consents to this. These playful scenarios reveal a vulnerability often disguised by the impressive spectacle of circus. It offers something human to connect with, a realness that makes this company’s performance all the more compelling. Their feats are, without question, impressive. The company dodge swinging poles and drop down them at speed – their split second timing as they stop inches above the floor is exhilarating to watch. 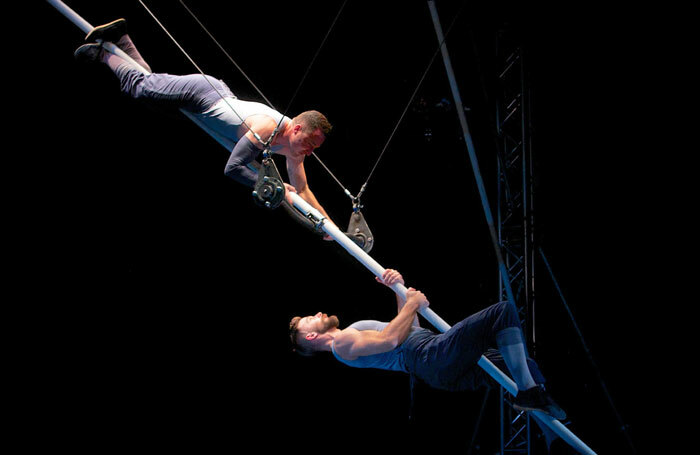 A duet between two men, where they see-saw mid-air while stood upon opposite ends of a suspended pole, is both thrilling and nerve-racking. 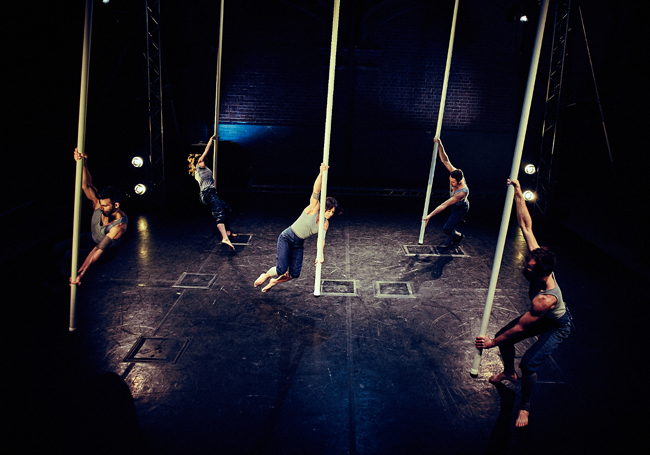 The agility and grace of the company makes such displays of strength and co-ordination appear almost effortless, but Ockham’s Razor linger just close enough to the edge to keep their audience on their toes. The company have also found a way to render their supreme physical skills accessible and engaging. Moments in which they defy gravity at the top of swaying poles are just as compelling as the performers’ ducking and weaving between them. There’s a particularly beautiful moment where four poles, controlled by counterweight, mirror the movements of a performer’s body in an enchanting dance. This is circus with subtlety and emotion. In an echo of the opening scene chalk flows from the end of a swinging pole creating circular patterns like a giant Spirograph upon the floor. As the lights fade its mesmerising swirls seem a fitting end to a spellbinding performance. 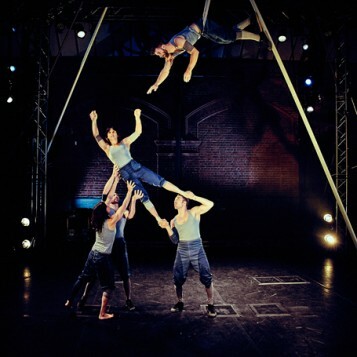 Exhilarating aerial theatre combining circus spectacle with subtlety, emotion and a touch of humour.